Ring2 Conferencing is a pioneering audio-conferencing software and services company – offering the world’s first remote control of dial-in conference calls control from a mobile device. Ring2 solves everyday problems and associated with business audio-conferencing, in the simplest possible way. In the world of collaboration, basic dial in audio-conferencing is by far the dominant part of the market representing over 80% of revenues. Why? In talking with customers, we learned that users like the simplicity of sending out toll free numbers and access codes to participants with the confidence that people will be able to easily get on the call. Ease and simplicity is key, the fear of technical embarrassment is paramount. However, if you ask the same users about their experiences on conference calls, most have anecdotes about missing participants, unknown participants and the perennial problem of the person joining from a noisy environment who does not know how to mute their phone. Ring2 keeps the simplicity and ease of dial in conferencing, but adds optional, easy-to-use remote control to help call leaders overcome the frustrations they face on conference calls each day. The core of Ring2’s service works just like traditional dial in conferencing where participants are sent a toll free number and a participant code so they can join the call and if the users so choose, they can use this basic functionality and nothing more. 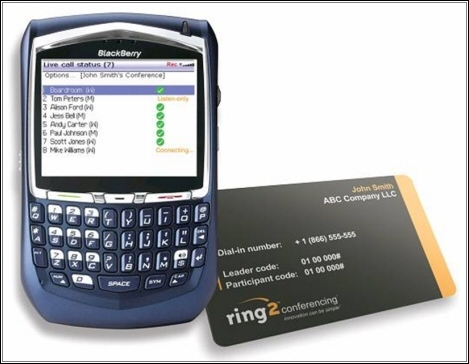 However, as soon as the first person joins a leader’s conference, Ring2 pushes a notification to the call leader’s BlackBerry letting them know that someone has joined their call. From there a single click allows the leader to ‘see’ dynamically who is on the call by name and then choose to join the call from any phone. During the call, new participants are identified to the call leader by name on their BlackBerry rather than a mysterious ‘boop’ and the leader can add missing participants from the BlackBerry address book or control individual legs to mute a noisy line or put a participant on hold for a private conversation. The Ring2 Conference Controller gives call leaders visibility and control over their conference calls reducing stress and increasing security for all concerned. What are the typical problems and headaches with business audio-conferencing? Is anyone listening in who shouldn’t be? How can you be sure others have dropped off the call when you want a private side conversation? How do you add someone into the call? How do you mute the person in their car or the noisy airport? Why remote control with a BlackBerry? Wouldn’t a desktop solution work just as well? The call leader is only at their desk for approximately 30 percent of conferencing calls, and according to Wainhouse Research, approximately 40 percent of conference calls are made from good old-fashioned meeting rooms. Therefore, a desktop-based solution is not that useful for collaboration. Why not utilize the trusty BlackBerry that users will always have with them? Why not just use a solution with richer collaboration capabilities? User issues with audio-conferencing are not so much that they need richer collaboration capabilities, but rather that their voice calls are subject to basic everyday headaches of visibility and control that have been overlooked in the quest for feature-rich collaboration. One of the main barriers to adoption of a richer collaboration service is that users are scared of them. They are worried that they will make mistakes (on the desktop interfaces) while on their important conference calls. On top of this, there is an adoption issue: why would a user who is used to going into a conference room and dialing into a call think to type in a URL, username and password to take control of the call? It is not a natural part of the way that people currently behave compounded by the fact that users often don’t have easy access to their PCs. As a result, utilization rates of broader collaboration solutions are very low, below 5% by most estimations, whereas Ring2 by pushing the pertinent information to the device that the user will most likely have with them at the exact time that they need this information is able to achieve a utilization rate in excess of 60%. How does Ring2 overcome barriers to adoption? First, Ring2 keeps the user interface super-simple (sequential questions that can be answered in seconds rather than multi-capable screen views). Next, Ring2 includes the fewest necessary features that solve real problems. It does not manifest capabilities of the technology for technology sake. Thirdly, in an enterprise environment, Ring2 believes in building the technology and service on what people use and are comfortable with today. Finally, by pushing the pertinent information to the user exactly when they need it, we ensure that the solution is not forgotten about in the fluster before joining a call. This is especially important as a service provider vs. a technology company. Service providers need fast adoption and mass usage to make money and can less afford evolution to a new technology. Ring2 customers operate in all sectors all around the world including law, banking, private equity, consulting, technology, media, recruitment and manufacturing, from multi-nationals to small businesses. Thank you for your time and congratulations on being considered one of the Best Products at WES 2007. Thanks very much, it’s a great honor for us and we appreciate you taking the time to learn more about what we do. See you next year!